Jeni Britton Bauer is the founder of Jeni's Splendid Ice Cream and the author of Jeni's Splendid Ice Creams at Home. To kick off next week's Ice Cream Week at FOOD52 (that's right -- stay tuned! 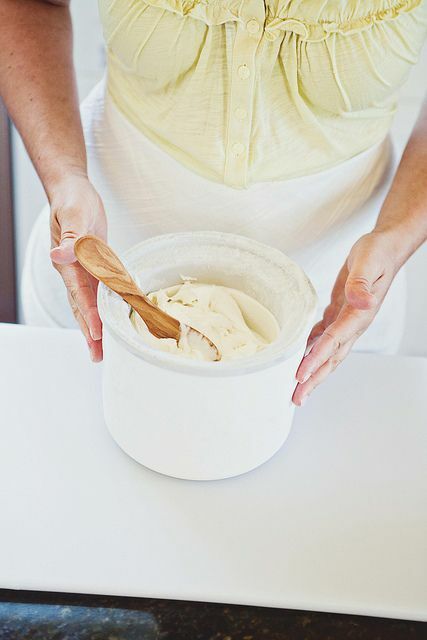 ), Jeni shares the blueprint for making her famous, splendid ice cream. Let me cut to the quick: I was never too excited about eating or making ice cream at home. Growing up in Illinois and Ohio, I can’t remember ever eating one bowl of homemade stuff that ever lived up to the hype. It was usually icy, eggy, slushy, and overly sweet, with little other flavor. Making ice cream at home was one of those “good, ol’ days” things that always seemed like a neat idea, but never tasted worth the effort—not when there was a Häagen-Dazs just around the corner and fully loaded with their dense, super creamy ice cream in a multitude of flavors. But the thing is, you can make ice cream worth the effort at home. All it requires is a balancing act. Ice cream is a frozen emulsion of water, butterfat (the concentrated fat in milk), proteins (whey and casein), sugars, starch, air, and flavor ingredients. It’s the balance of ingredients that determines the sensory facets: taste, texture, body, and finish. When I set out to adapt my recipe to countertop machines to write Jeni’s Splendid Ice Creams at Home, I wanted the homemade results to match both the texture and flavor of the ice creams we sell in our shops; I also wanted it to have the dense, creamy body that rolls beautifully into a frozen scoop and melts slowly like buttercream on your palate. My home recipe requires a slightly unconventional balance of ingredients that work together to create what I call “American scoop shop ice cream" — hard-pack, scoopable, super creamy, and flavored any way you like it. So you have an idea of what to do before jumping in, here’s an overview of the four steps you’ll take to make any ice cream flavor in my book. Some ice creams will call for ingredients that must be made in advance. Recipes for roasted nuts, sauces, candies, and cakes can be found in Basics (page 191). Have these components chilled and ready to go before beginning the process. 24 hours before you want to make the ice cream, wash the canister, dry it well, and place it in the coldest part of the freezer. Do not remove it until you are ready to pour the chilled cream into it. Pour the milk, cream, sugar, and corn syrup into a saucepan. Bring to a boil and set a timer for precisely 4 minutes—the timing is critical. Turn off the heat and add the cornstarch slurry to the ice cream base in the pan. Incorporate the hot cream mixture into the cream cheese. Do this a little bit at a time so that you can whip out any lumps of cream cheese. Pour the hot ice cream base into a Ziploc bag and seal. Submerge in the ice bath until very cold. Cut the corner off the bag, pour the chilled base into the ice cream machine, and turn on the machine. When finished, transfer to a storage container and freeze until firm, about 4 hours. The ice cream is finished at the exact moment when the machine isn’t freezing the ice cream anymore; the ice cream will begin to pull away from the sides (about 25 minutes). If you stop too soon, there will be a thin layer of really dense ice cream on the sides of the canister (see photo). Sorbets are done when they achieve the consistency of a thick smoothie; they should be frozen enough to be just barely pourable. If you fully freeze sorbets, too much air will be whipped in and they will become fluffy and crumbly. If you are packing the ice cream with a sauce (or variegate), alternate layers, creating pockets with the sauce. Be sure to put a bit on the bottom of the container and reserve some to put on the top of the ice cream. If you are adding chunks, layer them in evenly ?as you go. Then, working quickly, pack the ice cream into a container, cover with parchment paper or wax paper to seal out air, and let the flavors bloom while it hardens in your freezer for at least 4 hours. When you remove the ice cream from the freezer, let it sit and relax for 5 to 10 minutes before you scoop? and serve it — it doesn’t need to melt, but it does need to thaw slightly. Ideally, serve and eat it while it’s quite firm but pliable and you are able to easily roll it into a ball. Once you’ve scooped it, return any remaining ice cream to the freezer. If the ice cream has melted too much at room temperature, refreezing it will result in an ice cream that is too icy. Jeni will be answering questions about ice cream on the Hotline for those of you who want to take on this project at home. For the quickest response, go to her recipe and ask a question from there -- we'll email her your question right away! Excerpted from Jeni’s Splendid Ice Creams at Home by Jeni Britton Bauer (Artisan Books). Copyright 2011. Photographs by Stacy Newgent. Jeni Britton Bauer has honed her ice cream-making skills for nearly two decades and is the author of the New York Times best selling Jeni’s Splendid Ice Creams at Home. Learned of your ice creams when my daughter did her residency in Columbus. She gave me your cookbook for Mother's Day and I have been making ice cream at least once a week ever since! Your fantastic favors have inspired me to springboard and try things like cucumber mint sorbet, using your book for guidance. I NEVER thought I would be making ice cream at home! This is quite possibly the best ice cream recipe I've tried yet! It may also be better than big store brands. I have had rave reviews on all the recipes I tried. However I tried to create my own flavor by added crushed peppermint candies to the hot milk and also before freezing. It was delicious but never froze hard. What went wrong? It could be the cream cheese that is giving the "fatty" mouthfeel. My hubby and i just bought cuisinart ice cream machine and made your lemon cream ice cream. It tastes absolutely delicious but has a slightly strange fatty mouthfeel. Can anybody help as to why. Thanks in advance. ok...just ordered the book. In the meantime, I have to buy the lt. corn syrup. Hope we don't pop Dh's lapband. I love making the ice cream at home, but I have fond memories of going to the Grandview Heights location when I lived in Cbus. The Queen City Cayenne is my favorite flavor. Pear Reisling sorbet is great, too. I survived two years of graduate school only because my apartment faced the Jeni's Ice Cream parking lot-- I'd look onto the strip lovingly and tell myself that I'd get a scoop only if I finished whatever I was working on. I love Jeni's recipes! The sweet corn and blackberry is my absolute favorite. In the step where you have to bring the cream, sugar, corn syrup, and milk to a boil...it does not say over how hot of a heat. This could make a big difference in the outcome. Will someone please post the degree? I am guessing medium high heat, but that would only be a guess. Thank you. medium high heat yes. I usually keep it around the 6 or 7 out of 10 on my stove dial. Keep an eye on it for sure though! Without a doubt, this is the best ice cream I have ever made and....look Ma, no custard. I kept reading about Jeni and so I bought her book awhile ago and started to make her ice creams, sorbets and frozen yogurt. So, so, so delicious. My family and friends thank you, Jeni!!! I made the salted caramel ice cream from the book and it was delicious. It definitely had the very best texture of any homemade ice cream I have ever made or eaten. I did not use the ziploc bag, though. I just refrigerated the base overnight. I always look forward to making a stop at Jeni's shop when we visit my in-laws in Powell, OH. I'm madly in love with the book - the corn starch/cream cheese method is fool proof compared to a custard, and it has made this home cook a much more confident ice cream spinner. Made the Kona Stout ice cream earlier this week, and making the Banana today for one of the bases in an ice cream sundae dessert buffet! 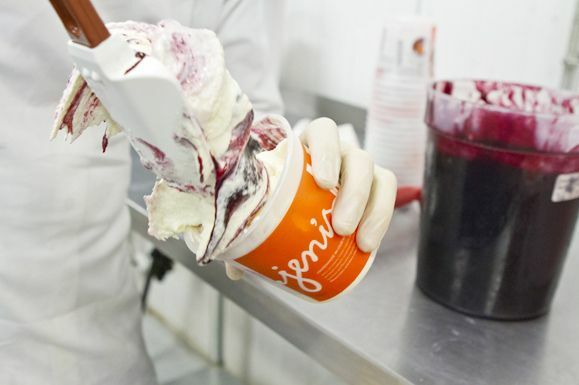 I first heard of Jeni when I saw a piece in Saveur and made beet/poppy seed ice cream. Then I bought the book. Now I make ice cream at least once a week. Even when I use a non-Jeni recipe, I use her cornstarch/cream cheese/corn syrup system and am always happy. Tonight it's goat cheese with roasted strawberries. Thanks, Jeni! Your ice cream sounds wonderful. I understand that you are exchanging the goat cheese for the cream cheese. Have I got it right? No. Keep the cream cheese. Use her base but add 1/2 cup of softened goat cheese. Whisk the goat cheese, cream cheese and salt together in a bowl. 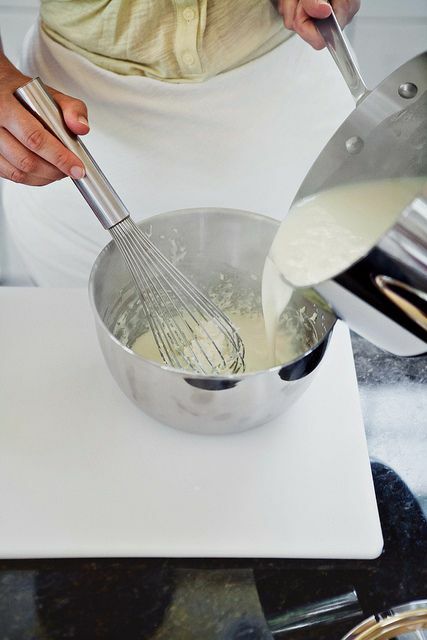 Then whisk the hot cream mixture to the goat cheese mixture, slowly, as though you were tempering an egg base. Then chill and freeze. Jeni - I have been making your recipes since I saw the Lemon Ice Cream recipe featured on Food 52 last fall and have become a devotee - for example, I made 3 flavors for topping Thanksgiving pies because it was too hard to choose a single favorite!! My family would call me crazy but they don't want to stop the flow of delicious ice cream. This book will change your life - well at least your ice cream-making life!